This past weekend Steve and I spent a lovely few nights in Pacific Grove and Monterey to celebrate our 12th anniversary. As we were sitting on our little back patio, we saw a mother and baby deer running down the road in front of a car, veering off into the side street where they slowed to a walk. We laughed because they looked around tentatively, as if they were lost. I’m pretty sure we saw the same deer just a few feet from a golf cart on the Pacific Grove golf course as we biked by, and later that night, I saw them in the parking lot. They seem to get around. 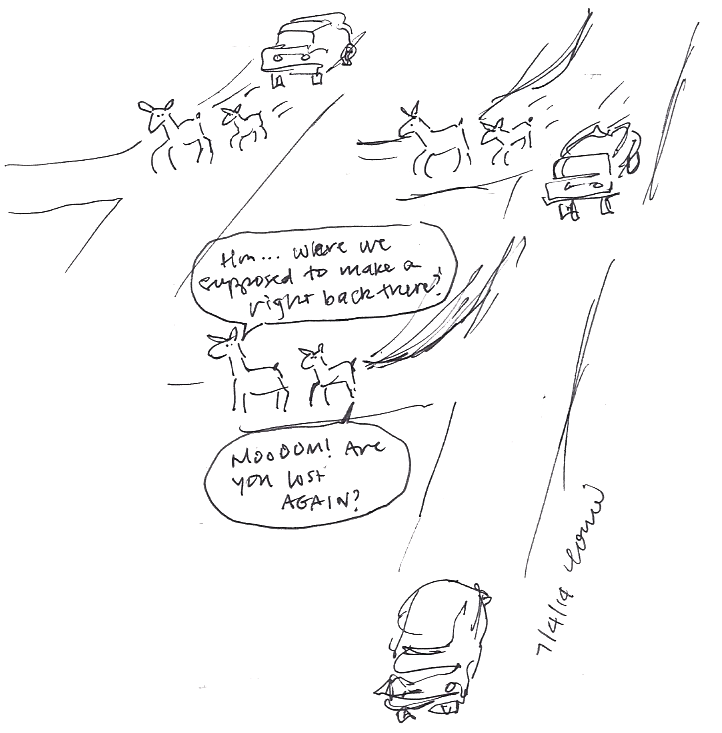 The above is an example of an off-the-cuff, quick, scribbly kind of comic, as I had my journal open in front of me when the deer ran by.